Another week, another throwback arena. Except everything is different because United: Missions is in the mix. It is time for Frontier Expeditions once again, and seven trade on turn one is still a thing. Here is my article from the last time we ran this format, in July 2018. Armed with that knowledge, you should still tread carefully because the entire game has changed! 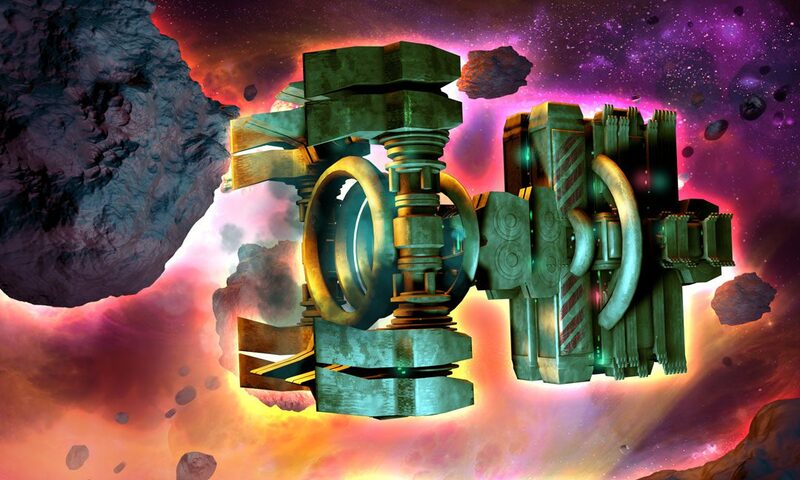 The Frontier Expedition scenario rule ensures that the scrapping can begin whenever you want, and that dramatic openings are possible for player one and likely for player two. Each player starts the game with two Explorers in the place of two Scouts in their starting deck. We’re playing with the Core Set starter and United: Missions expansion pack. Just an 80 card trade deck (as Missions are their own thing), meaning the most-consistent games you will ever see in the Arena. We’ve posted a long article discussing last week’s client update. It discusses everything from rules changes to how missions work. If you aren’t familiar, please have a look. The most important note is that you can only complete one mission per turn (just like tabletop play), and missions are automatically completed as soon as you meet the listed objective on the card. That auto-completion is like the auto-card draw in the app. Usually it makes playing the game much smoother, but every now and then it will screw with your plans. Be aware! I have struggled mightily this week. After four Arena runs, I am only 11-8 and that is nowhere near good enough to get this week’s foil. But my last run was a 5-2 (so close! ), and the biggest lesson I’ve learned is that missions are a unique challenge that require a new way to think. They are very different than gambits, even though they start in play and are not a part of your starting deck. Gambits generally have an impact on a specific turn. Missions literally can win you the game. Because of this, they need to be addressed throughout the entire run of play. You can’t see your opponent’s mission cards until they are completed. But you can know what they are by looking in the Card Gallery in the app, or in this article from 2016 when the tabletop version of the set was released. By removing the three you were dealt, and by seeing your opponent’s early purchases from the trade row, you can start to sort out which missions they might have. This is a difficult skill I am still developing, but I am convinced that the best players will be able to “get a read” on their opponent and out-maneuver them. An easier skill to master is knowing whether to go for a missions victory or not. For me, it depends on the combination of the mission cards you are dealt and the state of the trade row after the first set of turns. Some missions require certain factions, while others don’t technically require them but are much easier in some colors than others. Below is a list of the 12 mission cards, and my opinion as to how easy or difficult it is to complete them in this week’s format. Ally 10 This requires four different non-starter cards on the same turn, unless you have a base with an ability that sticks around. I have yet to complete this mission. Armada 4 Remember that your starting deck cards are all ships. 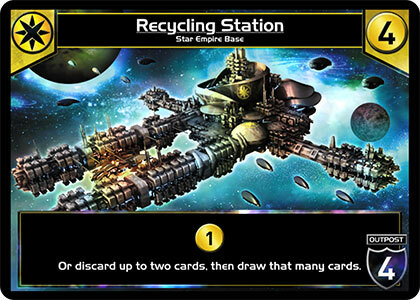 You just need to draw two extra cards (without using Recycling Station), which is almost trivial in the Star Empire. Trade Federation helps as well. Machine Cult is a bad match for this one. Colonize 5 Machine Cult's favorite mission. Thin your deck hiding behind Battle Stations or Junkyard... easy as pie. Harder with the other factions... though the Blob do it very well with Blob Wheel. That card being purchased early is a sign of this mission, or another one. Convert 3 Battle Stations being common help here. Defend 6 Again, another good one for the Machine Cult but even they can have trouble keeping bases in play for long. Core Set has a good balance between base defense and bursts of damage. Diversify 4 Requires Cutter, a card you want anyways, or several low-level cards from Trade Federation. 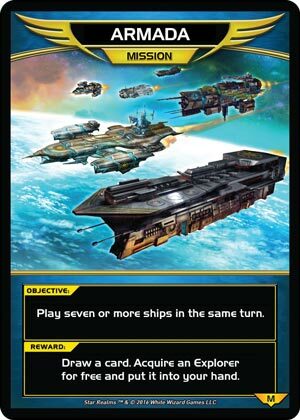 Dominate 1 Because of the two common card-drawing ships in the Star Empire, they have a greater chance of completing this mission than the other factions. Exterminate 4 Blob Wheel or nothing. I don't love this card in this format, and I value the reward you get for it (this week) to be not worth it. Complete this one last. Influence 7 Usually the last mission to be completed, but if you can somehow pull it off earlier than that, the midgame boost is crazy. You will scrap those free Explorers every single time, but it is still 4 trade and 4 combat! 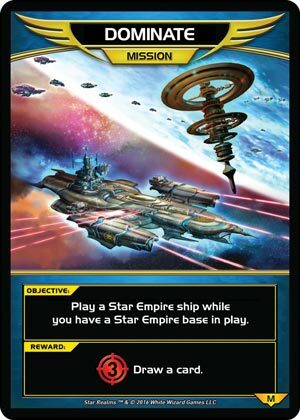 Monopolize 4 Trade Federation's common and uncommon bases aren't amazing in the Core Set. However, completing this gets you 10 authority -- usually enough to buy you an extra turn or two. Worth it. Rule 6 Surprisingly annoying to complete. Buy those Battle Stations - partly to deny them from your opponent while also helping yourself. Unite 2 If you complete this early, chances are your deck will run out of steam soon. But late game this is very easy to complete. To Scrap, or Not To Scrap? 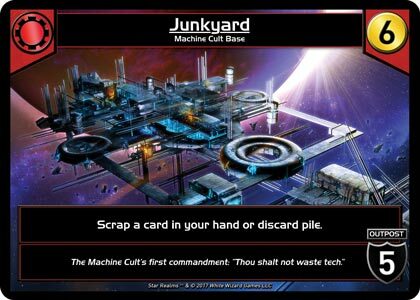 Because two of your starting-deck cards self-scrap, it can be tempting to jump into Machine Cult as soon as you can. 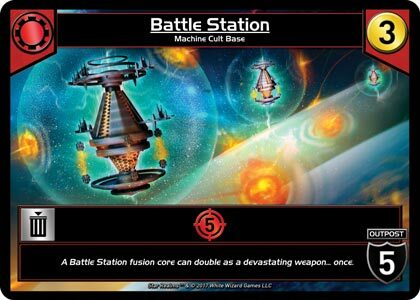 It is very possible to win most games of Star Realms by being the first player to scrap all 10 starting deck cards, and you can still do that in this arena. However, scrapping as a general strategy is not as strong as normal. Games are faster than normal, so you will have fewer opportunities to use them. And, because both players begin with some scrapping, the incremental value of additional scrapping is decreased. In other words, if I purchase Missile Bot on the first shuffle, I am likely to play it two more times throughout the game. I may play it a third time, but the game will likely end before my deck is shuffled again so that third scrap doesn’t count. Those two scraps that did count are fine, of course. Combine them with the two Explorers I would have scrapped by game’s end and that’s four scraps! Really good, but still only twice as good as my opponent, even if they did not purchase a single scrapping card. Yes, scrapping is good, but it isn’t as dominant of a strategy as in normal play with the Core Set. I will add that scrapping has always been a mission in the game, even without mission cards. The first to scrap their whole starting deck almost always wins. Your opponent would be put on a clock to hit with enough damage before you got to that state. Well, the dynamic is reversed this week. Scrapping is not enough to ensure a win! Your opponent might finish their missions, even after you have scrapped out! By no means is the Full Scrap a bad strategy – it just isn’t a dominant strategy as it is in the Core Set without mission cards. Because scrapping is not an auto-win, all sorts of strategies are viable. There is a bit of rock-paper-scissors-lizard-Spock going on, where missions victory is more reliable than scrapping, scrapping is more reliable than big budget trade decks, and those are more resilient than straight aggro, which is usually going to be too fast for missions victory. Of course, each aspect of these strategies can add to another, and that is part of why I love this game so much. Because missions should play an important part in your strategies this week, this section would need to be 12 pages long, one for each mission! 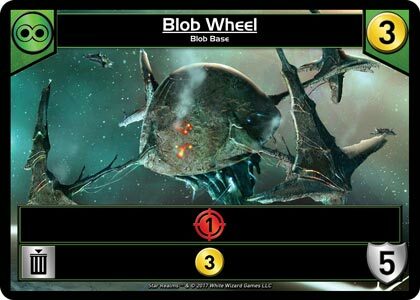 However, Blob Wheel and Battle Station will be co-MVPs this week. They are cheap, reliable bases that help complete multiple missions. I’ve never purchased as many Blob Wheels as I have this week. Don’t sleep on that card. I know I have many lessons left to learn. United: Missions changes the game more than any set since the original Gambits set in 2014. Whether you agree with my table or not, I very strongly encourage you to track your own play with the mission cards. Learn which ones suit your style the most, and use that as a guide to determine if you should use any given hand of missions as a help, or as the main way to win. I finally got to 100 stars this week. Whether you are at hundreds of stars, or just starting out, I hope this article helps. Good luck out there.